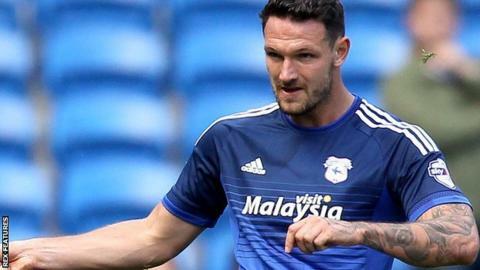 Cardiff City defender Sean Morrison looks set to be sidelined for more than a month after suffering a knee injury in Friday's 1-0 loss at Birmingham. Morrison, 24, had been ever-present in the Bluebirds defence in the Championship so far this season. Ben Turner, who Cardiff had considered recalling from a loan at Coventry City, will see a specialist on Wednesday after sustaining an ankle problem. Cardiff are now considering signing a centre back during the January window. The club have lost "two top end Championship defenders" according to assistant manager Scott Young. Asked how many players the club might need in the January window, Young said: "It's a difficult question. If you go from before last Friday, we probably would not have needed a centre half. "There are question marks going forward when we find out what we need in terms of the two lads getting injured." Cardiff are waiting for a full report on Morrison's knee injury, but have been told he would be out for between "four to six weeks". Initially Cardiff had contemplated recalling Turner to cover Morrison's absence, but he was injured in Coventry's 1-1 League One draw with Oldham on Saturday. "To lose them two is obviously a blow," Young added. "We had a bit of upheaval when Sean came off at Birmingham but when you have Bruno (Manga) on the bench, he is not a bad replacement. "Bruno is very composed. He was our player of the year last season. He's been very unlucky with injuries not to get into the team. But Sean and Matt Connolly have been a very strong partnership. "He's had to wait for his chance and now he has got to take it. "Any player not playing in the first team, week in and week out, is going to get frustrated at times. He's waited for his chance and now he has got to grab it with both hands." Cardiff will train and then travel on Christmas Day for the Championship game with Milton Keynes Dons on Boxing Day.